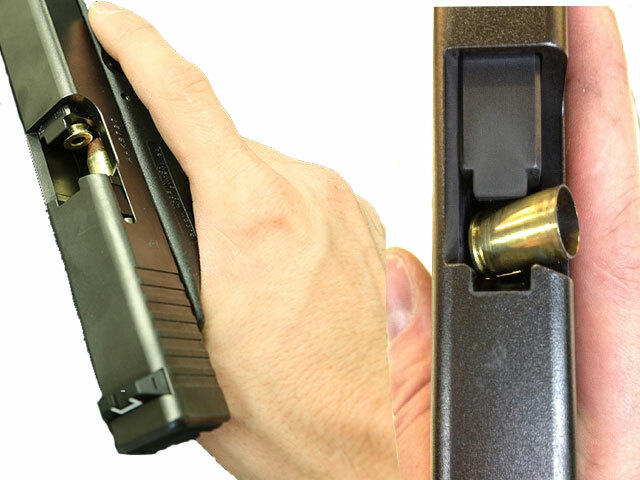 There are a few common firearm malfunctions, one of the chief among them is a failure to eject, where a spent case is not ejected from the pistol and keeps the slide from cycling. A failure to eject, otherwise known as a FTE, can take a few different forms and has several common causes. Just like a failure to feed, the cause can be diagnosed and addressed. The good news is that the cause is usually rather minor and can be addressed in a matter of minutes. That said, let's find out a bit more about failures to eject. There are two basic types of failure to extract. There is a stovepipe, where a spent case gets caught in the ejection port, and a failure to extract. 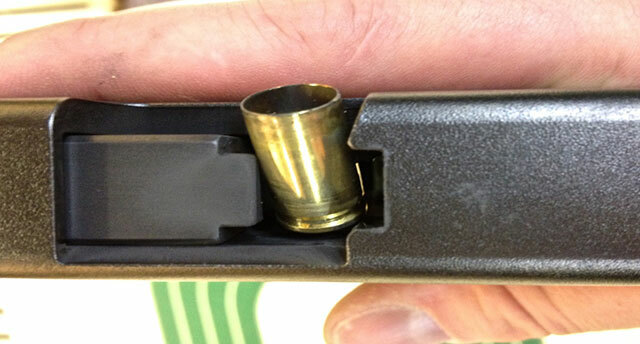 In the latter case, a round is fired but isn't extracted out of the chamber. Just like a failure to feed, this is an issue that pretty much only affects semi-autos. The revolver crowd doesn't deal with it as much, though an ejector can certainly get break. In the former instance, the round will get stuck between the slide and the barrel throat while ejecting, due to the slide cycling too fast or too slow an ejection. It looks like a stove pipe is sticking out of the chamber and thus you get the name. In the latter instance, the round just didn't get pulled out of the chamber after firing. Each has their own causes and fixes. A stovepipe has several common causes. First, if the ammunition you're using has too weak a powder charge, it won't cycle the slide correctly. This could be due to switching to lower-pressure rounds, a bad batch of factory ammunition or a poor handload. Another common cause is the recoil spring. 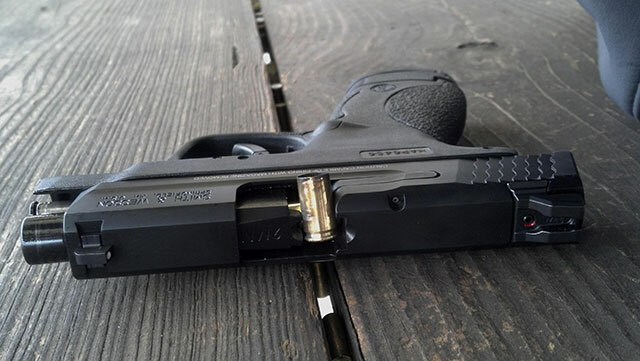 If you're using a recoil spring with too much tension for the ammunition you're using, the slide will cycle faster than the spent case is sent out the ejection port. If ammunition is the cause, either use a more appropriate load or cease using faulty rounds. 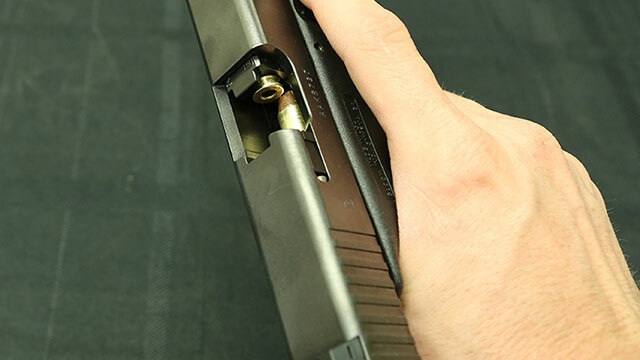 Limp-wristing can also cause a stovepipe, as not holding the pistol firmly enough can cause the slide to not cycle correctly, leading to a shorter return stroke and a stovepipe. Riding the thumb too high on the slide will also interfere with the pistol cycling and lead to a stovepipe. The extractor is also a cause of stovepipes. If the extractor is worn down, or if it does not have sufficient tension, the round will not be pulled from the chamber and ejected with sufficient force. This holds it up in the ejection port and causes a stovepipe. When a stovepipe happens, you pull back the slide to get the round free. At that point, you must diagnose what the cause of the stovepipe was. Tightening the grip and ensuring you aren't short-stroking the slide with the thumb or anything else will rule out these causes in short order. If the problem doesn't repeat itself, it's possible that it was a bad round which does happen. However, if the problem repeats itself, then you may have a mechanical issue. First, make sure that you're using an appropriate recoil spring weight for your ammunition. Lighter loads require lighter springs, hotter loads require a stiffer spring. You may also want to replace your recoil spring if it's getting worn out. You may need to tighten the extractor. Field strip the gun and inspect it. If the extractor is too loose, or if it seems worn, it could need either tightening or replacing. Of the two types of failure to feed, a stovepipe is a little more common but total failures to extract can occur. Unlike the stovepipe, however, there are far fewer causes and thus is easier to diagnose. If a spent case completely fails to be extracted from the chamber, the causes are either the extractor or the barrel throat and/or feed ramp. Extractor hooks that have been worn down from use won't be able to grab the spent case. A visual inspection will reveal if this is the cause, as the extractor hook will appear quite worn. Replacement will be warranted, though extractors are typically quite inexpensive. The extractor may also require either tightening down or may require new springs in order to function properly. The extractor should have some play, but not too much. This fix is also typically very easy and quite cheap. The other common cause of a failure to extract is a dirty or otherwise rough feed ramp. In this instance, buildup of carbon and other deposits cause the round to stick in the chamber. Likewise, a feed ramp that has been roughed up due to use can cause a round to fail to extract. You'll be able to tell which it is by a visual inspection of the barrel. In case of the former, usually a good cleaning will resolve the issue. Polishing the feed ramp can be done at home with either sandpaper or a dremel tool. You'll want to use 600 to 800 grit, but no rougher than 600. Remember that the goal is to polish the feed ramp and smooth the material, so avoid taking off too much material.